1. It’s relief for stress and depression. Bag work is a paradox: slamming your fists into a bag looks aggressive and chaotic, but it actually actually displaces negative energy, releases tension and provides concentration and renewed focus. 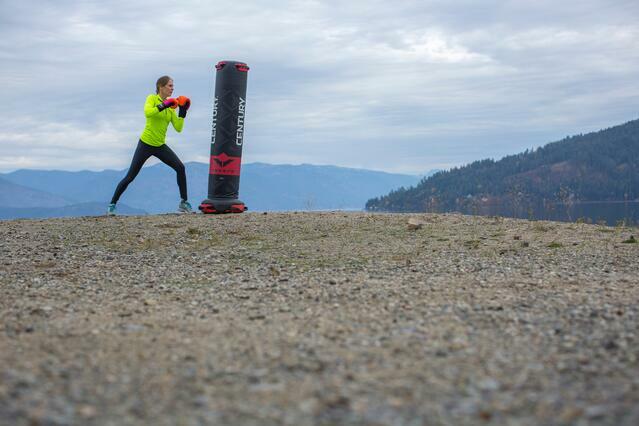 Punching a bag releases endorphins – which act as painkillers and restore a positive mood, naturally. It generates a strong sense of calmness, confidence and control that melts stress and can even help relieve depression. You walk away from a bag workout with a clearer mind. Fitday, PopSugar, Livestrong, Psychology Today and others explain the compelling reasons why boxing for fitness is a powerful method of restoring one’s psyche. For even more motivating stories, go to Google and search “how boxing saved my life.” You’ll see dozens of accounts from individuals on how this training had a profound impact on their lives and wellbeing. 2. It augments self-defense skills. Cardio boxing and cardio kickboxing are not, by themselves, self-defense. However, these classes teach many skills that contribute to good self-defense: increased self-confidence, muscle memory, and the knowledge of how to punch. Many people, women especially, underestimate their own power. A cardio boxing class lets them prove to themselves that they’re stronger than they ever imagined. It may give them the final boost of confidencethey need to take self-defense trainingat your gym or at a community event (many nonprofits, churches, schools, and businesses will host free self-defense classes). 3. Role models are doing it. Supermodels like Gigi Hadid and Adriana Lima have demonstrated their punching prowess on YouTube and social media, inspiring many people to follow suit. Thanks to them and other star names, boxing and kickboxing are officially “cool” – and who doesn’t want to try a model’s workout routine? Group fitness programs like Christa Dipaolo’s Box180 or Piloxing are helping people work cardio while building endurance and strength. Learning the proper form and technique is essential to getting the best results from partner training or bag work. The right skills generate significantly more power and reduce the risk of injury. Practicing and perfecting correct technique improves performance, footwork, balance and reflexes. And finding resources to improve technique is easy thanks to the internet: Watch and learn from pros like Tyler Hill, Freddie Roach, or John Hackleman (see videos below), or find other routines online. 4. It’s a powerful cardio workout. Boxing and kickboxing bag work torches calories. This is because when you twist to throw a punch or kick, you’re engaging your entire body. You put throw your entire weight into striking, and the harder you punch, the better the workout! Bag work is an awesome aerobic activity that rapidly increases heart rate and demands oxygen circulation from the entire body. Additionally, many boxing and kickboxing classes incorporate a variety of circuit-training stations and functional fitness workouts, just to make sure you leave the gym totally spent. 5. Word of mouth gives it a boost. Talk between friends has always helped fill up fitness classes. This works especially well for boxing and kickboxing because of how unique the activities are. People are usually bursting with pride to tell friends and family that they got to beat up a bag. They’re sincerely excited to talk about what they do, once they realize how much confidence they’ve gained and how well they’re able to turn stress into positive energy. For some, it’s simply the thrill of entering the unknown universe of boxing and kickboxing. More examples of great testimonies and experiences can be searched on PopSugar, or just ask a friend who has first-hand experience. Nothing in the world is more convincing than the word of a trusted friend or relative. The list could go on. 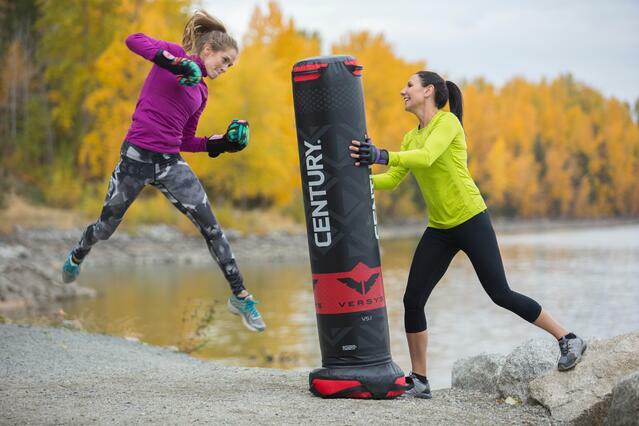 Demand for punching bags and gloves is surging because the benefits are real, equipment is cheap, and it draws a crowd. Less than $100 can get a punching bag, and another $40 (or less) buys decent pair of gloves. Find a trainer, try an I Love Kickboxing group class, or follow experts on YouTube. Odds are you’ll find some value worth sharing with others. You can also read more here about starting a cardio class, making sure you have the right equipment, choosing the right bags and gloves, and even setting up your class!